These Pure Silver Dominoes are elegant .999 fine silver bullion version for the traditional game of dominoes. These deluxe Pure Silver Dominoes are a beautiful and unique way to hold and enjoy fine silver bullion. Like playing cards, Pure Silver Dominoes are the inspiration for a variety of games of skill and chance. The long history of Dominoes extends to Europe and probably China, yet they are rarely seen in this fine Silver Bullion Domino format. Meticulously crafted in Germany, these fine Silver Dominoes are ideal for the business executive, the market watcher, and anyone who is looking for beautiful fine Silver Dominoes to hold, display, and value. Each silver domino tile is partly covered with black rhodium making it less sensitive to scratches and tarnishing. In this exquisite set, each of the 28 Silver Domino tiles is fine 999 silver bullion, and each weighs 50 grams (holding just over 1.6 oz of silver bullion in each Silver Domino). Hallmarked to indicate fine silver bullion weight and purity, all these Pure Silver Dominoes are carefully held in a beautiful box. Together, this item contains 1,400 grams or over 45 troy ounces of fine silver bullion. 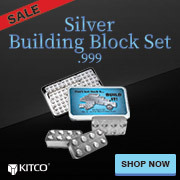 Kitco recommends keeping these precious Silver Bullion Dominoes safely packaged to minimize scratching of the surfaces. Degussa Goldhandel GmbH is an established silver bullion company headquartered in Frankfurt. Although the Degussa trademark was only registered in 1980, its roots go as far back as 1843 as a gold and silver separation factory established by Friedrich Ernst Roessler. In 1873, several banks and the Roessler family incorporated Deutsche Gold in order to secure its operations to refine large amounts of bullion for the newly establish German empire. Today, as a continuation of its commitment to the traditional trade of precious metals, Degussa offers a range of gold, silver, platinum and palladium bars manufactured to the highest standards by LBMA recognized refiners Argor-Heraeus SA and Valcambi SA through various retail outlets around the world. Why buy Silver Dominos from Kitco? Kitco is a trusted leader in the silver bullion and precious metals industry. Silver and other precious metals sold by Kitco are recognized in silver bullion markets around the world. With our focus on silver bullion, you can benefit from our low silver prices and premiums that are highly competitive in the silver bullion industry. At Kitco, we make it easy for you to manage your tangible wealth. You can sell or buy silver and other precious metals using our convenient online store, or by contacting our team of highly trained precious metals specialists. Backed by our global information network, Kitco has proudly served our customers since 1977.